Hot Cross Buns are an Easter tradition. 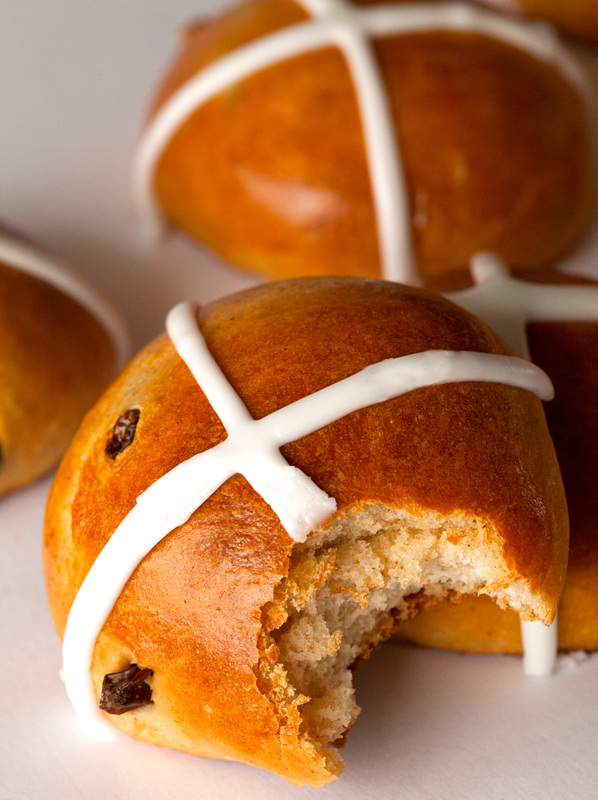 With the sweetness of cinnamon sugar and raisins, these buns are irresistible. 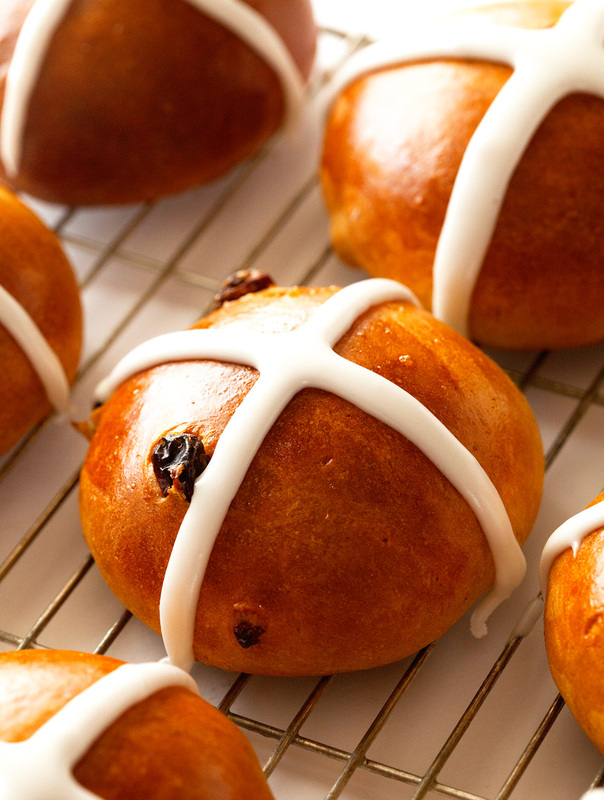 With Easter almost exactly one week away, I thought today would be the perfect day to post these Hot Cross Buns. We’re getting together with one side of our family this weekend and these buns have family get-togethers written all over them. What’s not to love when it comes to freshly baked rolls? 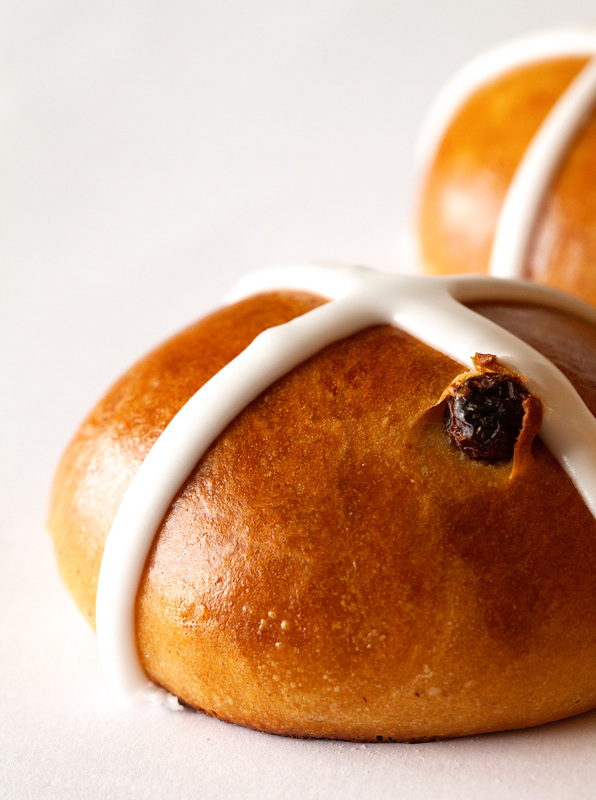 Hot Cross Buns are usually eaten on Good Friday, which is definitely more than appropriate, but I love the idea of serving these on Palm or Easter Sunday as well. They are so pretty and would complete any brunch menu. I have had my fair share of these buns over the years, but this was my first time making them myself. I remember having these around during Easter as a kid and I always got so excited when I first saw them. Until I remembered that there were raisins inside. Let’s just say I was somewhat of a picky eater and never understood why in the world my Mom had to add raisins to something that would be so much better without them. Good thing I left little Kathi’s palate behind and learned to embrace them after all. These buns just wouldn’t be the same without the fruity component. Extra chewiness and sweetness should not be passed up by anyone :). While working the raisins into the dough gave me a good laugh, my very favorite part was piping the crosses on top of each roll. I love the feeling of having accomplished something that I had always wanted to make and giving it the finishing touches. The icing is so thick and absolutely to die for. I know it will be extremely hard for me to make these buns only once a year. There would be no complaint if these little guys somehow magically appeared on our dinner table every weekend. There’s nothing like homemade buns. Worth every minute you spent in the kitchen. I promise. Now tell me, do you have any fun holiday traditions/memories? Please share :). Either way, hope you all have a fantastic weekend ahead. XOXO. 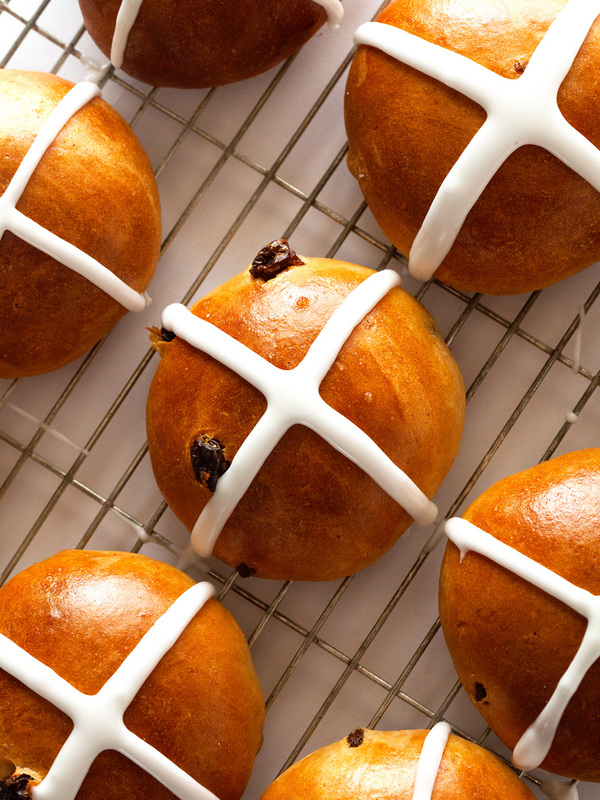 Hot Cross Buns are the perfect addition to your Easter menu. Cinnamon sugar and raisins are packed into these soft and fluffy rolls for ultimate flavor. 1. In a large saucepan, combine 2 cups whole milk, oil, and 1/2 cup sugar. Heat mixture until hot and sugar is fully melted, but don't bring to a boil. Remove mixture from stove and let stand for 20 minutes. Sprinkle yeast over the top. Stir with a fork and slowly add in 4 cups of flour. Cover with a clean kitchen towel and let rise in a warm place for about 1 hour. 2. Add the remaining 1/2 cup flour, baking powder, baking soda, and salt. Stir until fully incorporated. Lightly flour your work surface and place dough on top. 3. Combine 3 tablespoons sugar with cinnamon. 4. Flatten dough and sprinkle with 1/3 of cinnamon sugar and 1/3 of the raisins. Fold into dough and flatten once again. Repeat two more times, until no more cinnamon sugar or raisins remain. 5. Divide dough into 18 portions and shape into balls. Place on a greased baking sheet and let rise in a warm place for another hour. 6. Preheat oven to 400 degrees F. Combine egg with a splash of milk and brush tops of rolls with a pastry brush. Place in the oven and bake for 15-20 minutes or until tops are nicely browned. Remove from oven and let buns sit on baking sheet until okay to handle and transfer to a wire rack to cool completely. 7. Once cooled, combine confectioners' sugar and milk. Icing should be fairly thick (it should not run off your fork or spoon, but should stick to it). Spoon icing into a piping or ziploc bag and pipe a cross on each roll. Buns will keep up to 3 days or up to 2 months stored in the freezer. 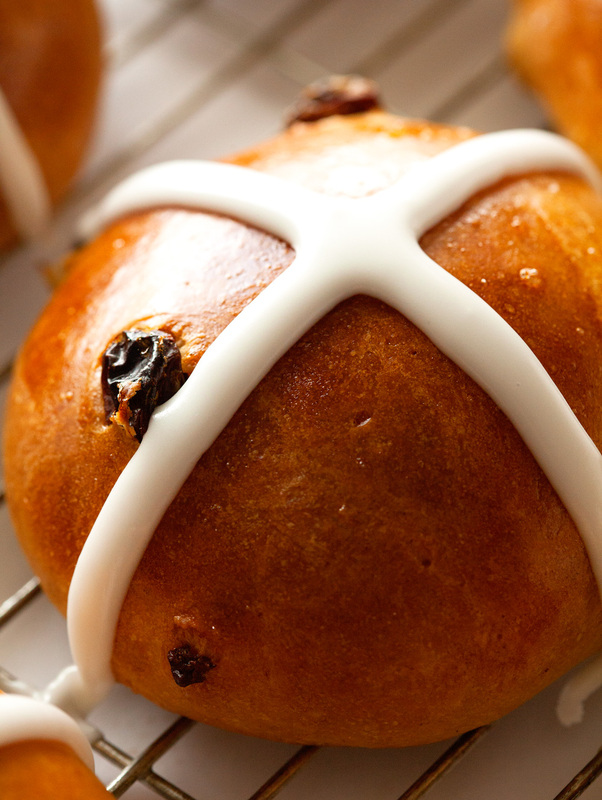 These hot cross buns look amazing! I bet they tasted amazing toasted with loads of butter! 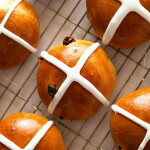 Your gorgeous photos have just convinced me that I HAVE to try my hand at homemade hot cross buns. Like stat. They seriously look like they came from a bakery they’re so gorgeous. LOVE how golden they look on the outside and how soft and pull-apart fluffy they are inside! And omg that perfect cross of icing! pinned. Thank you so much, Sarah! Your sweet comment brought a huge smile to my face :). Hope you get a chance to make them – they are so worth it! Any idea how substituting butter or olive oil for the canola goes? I’d assume 1/2 cup of oil but would it be less butter or same weight in grams? They look awesome but I’ve never used canola oil and my last few lots of bread have been hit and miss enough that I don’t want to deviate too much! If you want to substitute olive oil or butter for the canola oil, I would substitute it 1:1. It is always best to substitute a solid fat with a solid fat and a liquid fat with a liquid one since they affect the texture differently. Hope that helps. I used to hate raisins when I was little too! It was basically the end of the world if I grabbed what I thought was a chocolate chip cookie, but it was really an oatmeal raisin cookie. The horror! But now, I love raisins, and my favorite bagel is a cinnamon raisin bagel. Go figure! Haha. I can totally relate – there’s no expressing the feeling that came over me when I mistook an oatmeal raisin cookie for a chocolate chip one. Good thing taste buds change :). I would happily take either one now! Better late than never :). These buns are so good – hope you’ll make them sometime. They are one of my favorite things to make this time of year!! Thank you, Christine! Thank you so much, Bianca. Nothing beats a good Easter brunch! 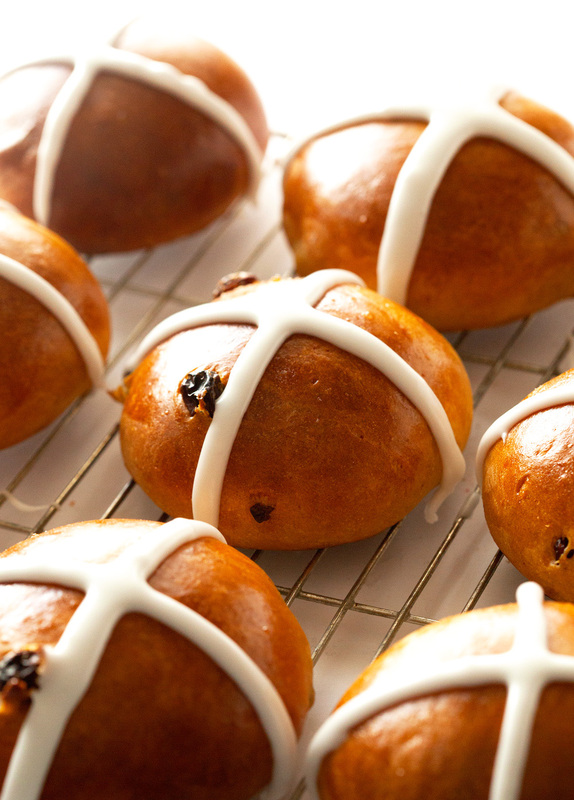 Nah – you’re not missing the point of Easter, even though these buns are definitely worth making. You won’t be disappointed. Thanks, Chelsea!! I always forget to make hot cross buns during Easter! Must remember this year. Yours look so so so good! These buns look super moist! Will be trying them soon! Thanks, Layla. Hope you enjoy!! “Carbs for life, yo.” … I love this! Your desserts always look so amazing, like I want to take a bite out of my computer amazing. These hot cross buns are no different. Yum! The photography is phenomenal!! its making me drool over here. I want to jump in my kitchen and try these right now! Ha! I totally understand, Joyce. So glad you liked them! !